A January 19 demonstration of over 500 people asserting Papuan rights to freedom of expression defied a police ban on gatherings in the remote town of Oksibil, in the Pegunungan Bintang (Star Mountains) Regency, close to the Papua New Guinea border. Challenging police to arrest over 500 people, the protest also announced a boycott of provincial gubernatorial elections being held in the regency until January 29. Credible local sources reported to West Papua Media that local Papuan people had been frustrated with ongoing restrictions on independent Papuan political expression, and were asserting their human rights to free expression despite the risk of arrest. “(We are here) to express the community’s opinion through a statement from the indigenous community of Papua, in regards to the matter of the blocking of the planned visit by the U.N Special Rapporteur on the Promotion and Protection of the Right of Freedom of Expression and Opinion, Mr Frank La Rue, to Indonesia from 14-26 January 2012 which relates to the the decisions of the Human Rights Committee 107 and 108 at the U.N Session in Geneva,” a spokesperson for the local rights group West Papuan Interest Association told West Papua Media via email. The sources also reported that the gathering was angered by the Regency police chief’s ban on public free expression, and so withdrew their consent and participation to the notoriously corrupt and divisive Indonesian imposed provincial gubernatorial election process. The WPIA spokesperson told West Papua Media on Saturday afternoon via SMS that a large (but unspecified number) of police were physically blocking the demonstration from occurring, despite the rights to Freedom of Expression being guaranteed in both Indonesian law and also Special Autonomy legislation. “The WPIA had sent a letter to the Head of Police in Pegunungan Bintang regarding the matter of the above peaceful gathering and advising them it would be carried out at Oksing-sing (in Pegunungan Bintang) on 23 January 2013, and that the group would remain in one location, nor would not disturb the proper order of public affairs or public activities, and would not be breaking any rules,” said the WPIA spokesperson. “However the Head of Police in Pegunungan Bintang gave a letter in response saying they would not authorise the gathering,” said the spokesperson. According to witnesses though, the gathered people were determined to go ahead with the planned action. Speakers said that if the action was prevented from occurring, the entire crowd of over 500 people would go immediately with the WPIA Organiser to the Pegunungan Bintang Police Headquarters. 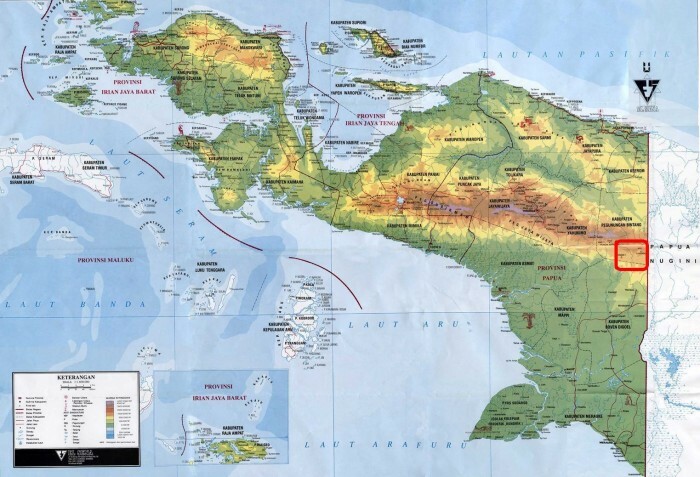 “They would demand that the Police detain every one of them in the prison until 29 January 2013 after the general Election for the Provincial Governor, and then release them after that,” the WPIA spokesperson told West Papua Media. Police reportedly backed down after this, though West Papua Media has not as yet been able to independently verify this. Oksibil historically only has sporadic public events of political free expression, and remote area expressions of political dissent have usually been met with brutality. For the police to not forcefully disperse a gathering is exceptionally uncommon. The demonstration self-dispersed without reported incident, and no reports have been received as yet about any reprisal actions from police.